All Bridal Classics' Veils are carefully hand cut with great attention to detail in our Canadian manufacturing facility in Kitchener, Ontario Canada. Our veils are available in all lengths from elbow to fingertip to royal cathedral. They are finished with lavish trimmings including: crystal/rhinestone trim, satin cord ('rattail'), soutache (cording), satin and organza ribbon, Italian satin bias, taffeta bias as well as a simple matte or metallic serged edge. We also offer a wide range of beaded veils which are delicately spotted by hand. 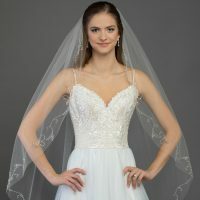 The beaded detail on our veils is done with Austrian Crystals, a variety of Swarovski products including rhinestones and crystal and may also include pearls or appliqués. We understand that no two brides are exactly alike and that even accessories must be 'just right'. 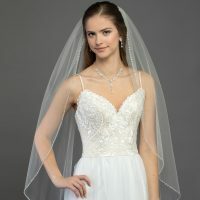 In order to accommodate this we can customize each veil within the Bridal Classics line to best suit each customer's preference with regard to cut, length, colour and beading. All of our veils are available in white, ivory, diamond white and beige (gold) tulle. 100% silk veils are available and are a must when it comes to accessorizing silk gowns. 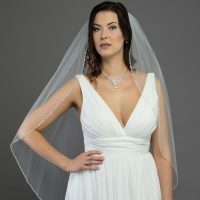 We also offer veils made with 'sparkle illusion' tulle in white, ivory and diamond white. 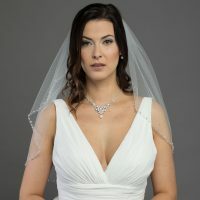 Bridal Classics Veils can be decorated with coloured rhinestones, crystals and trims to match our tiaras and most bridal gowns. The Marquise Veil collection is locally designed and then imported from overseas. Importing these elaborate styles rather than manufacturing them in Canada allows us to provide considerable savings to our customers. The intricate bead work, embroidery and beaded edges boasted by the Marquise Veil collection echo the patterns seen on many of today's bridal gowns and are the finishing touch to an outstanding bridal ensemble. Since this collection is made overseas we cannot offer custom changes on these styles. Marquise Veils are available in white or ivory tulle, while the colour availability on detail will vary by style.